Anyone use XHP70's? Im wondering how you guys are driving your leds as they use 6 or 12v. Im using mtnelectronics FET direct drive driver. Anyone else experiencing over heating problems in their builds? There aren't many BLF members with xph70 builds let alone anyone here on LPF that I know of. All I would say is be careful with that kind of setup. Some members have recorded a current draw in excess of 20A from a pair of HE2's in series. You better have a good heatsink for it CORRECTION: That was with two HE2's in series and three xhp70's in parallel. I draw 8 to 9 amps from 2VTC5 18650's and thats already 60w(led is rated at 32w). I can only run it at full power for a minute to two before I need to shut it down to prevent over heating. I thought lots of people had XHP70 builds at BLF (my build was 80$ ish). When the XHP is coupled with a deep reflector it has some crazy throw. Im actually using the stock heatsink for it (aluminium pill) and it seems to do fine. nor should there be any issues with using the stock aluminium heatsink. What host do you have this setup in? With my above post the 20A figure was a severe exaggeration... the edited post explains what scenario that figure occurred in. A single xhp70 maxes out at approximately 10A anyway. I have the 6V led so I can DD it with 2 cells. 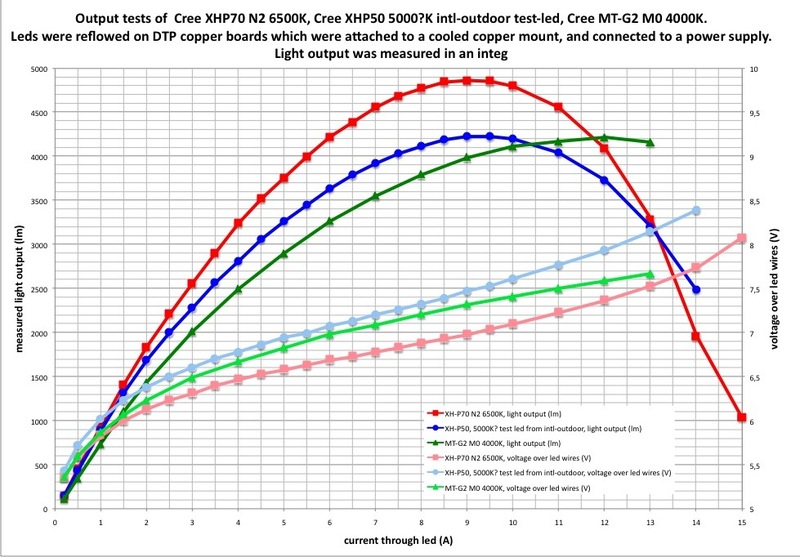 That graph looks like its for the 12v version? That voltage vs amps graph seems weird as the led is being waayyy over driven(if in 6v config) or underdriven (if 12v). Im not sure how they are pushing 100w through the led without burning the led.